Culinary expert and food writer Gail Simmons returns to The Talk to bring Top Chef: California into our own kitchen. 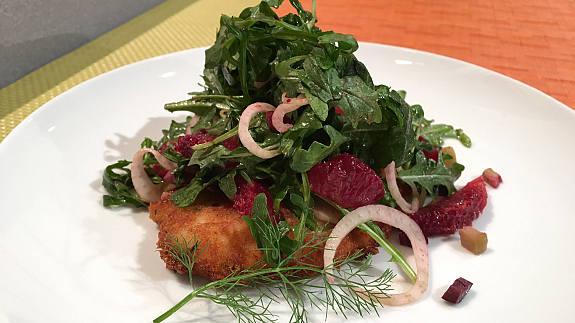 Using ingredients inspired by the Golden State, Gail delivers a delicious citrus salad on top of a flavorful crispy chicken breast. 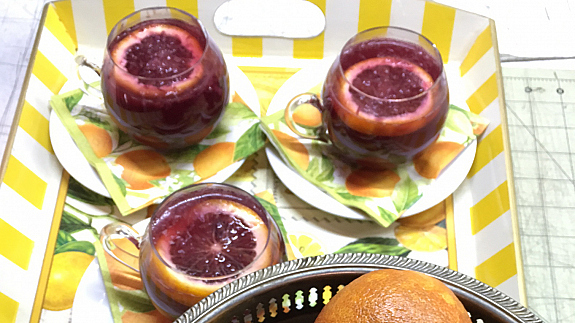 Serve it up with her sparkling blood orange punch and you’ve got a complete meal to make you the top chef of your own household! Both of her wonderful recipes can be found below. For more of Gail’s guidance and expertise, be sure to watch her on the judges’ panel of Bravo’s hit series Top Chef, Thursday nights at 9/8c. Toss all vegetables together in a large bowl. In a small bowl, whisk together Dijon mustard, garlic, lemon and remaining orange juices. Whisk in olive oil in a slow, steady stream until well combined. Season with salt and pepper and set aside. Rinse chicken breasts under cold running water and pat dry with paper towels. If the breasts are whole, split them down the middle into even halves. Place each chicken breast half between two sheets of plastic wrap and lay flat on a cutting board. Using the flat side of a meat tenderizer (or the back side of a small saucepan) pound each breast, working from the center out, until it is about 1/2 an inch thick. Set up your breading station: Place flour in a large flat dish and season with salt and pepper. Pour buttermilk into a second flat dish. In a small bowl, mix together the breadcrumbs, lemon zest, parsley and oregano and season with salt and pepper. Pour breadcrumb mixture into a third flat dish. Working with one piece of chicken at a time, dredge first in flour, then dip in buttermilk and finally coat well with the breadcrumbs. Gently press the breadcrumbs into each piece of chicken so it’s coated evenly. Place chicken on a flat tray in a single layer as you coat each piece. Set a large, non-stick pan over medium-high heat. Add the oil. When the oil is hot and begins to shimmer, carefully place first two chicken pieces into the pan. Do not overcrowd the pan. Pan fry each piece for 3-4 minutes per side until golden and crispy. Drain on paper towels and finish with a sprinkle of salt. Just before serving, pour vinaigrette over salad and toss well to coat. Plate each paillard topped with a pile of fennel, olive and orange salad to serve. In a small saucepan, combine water and honey. Heat on medium-low, stirring, until honey is evenly dissolved. Allow to cool slightly, then refrigerate until well chilled. In a large bowl, combine honey water, blood orange juice, lemon juice and Lillet. Just before serving, slowly add Champagne or sparkling wine. Top with blood orange slices. Ladle into glasses over ice to serve.